The proportion of family income to meet loan repayments increased to 34.3% over the past 12 months to June 2018 quarter3 in Victoria. That said, the number of first home buyer loans grew by 35.5% over the past 12 months to the June 2018 quarter, higher than the 12.6% reported in the December 2017 quarter. Table 2 provides the percentage of suburbs available for house buyers, based on particular price range. 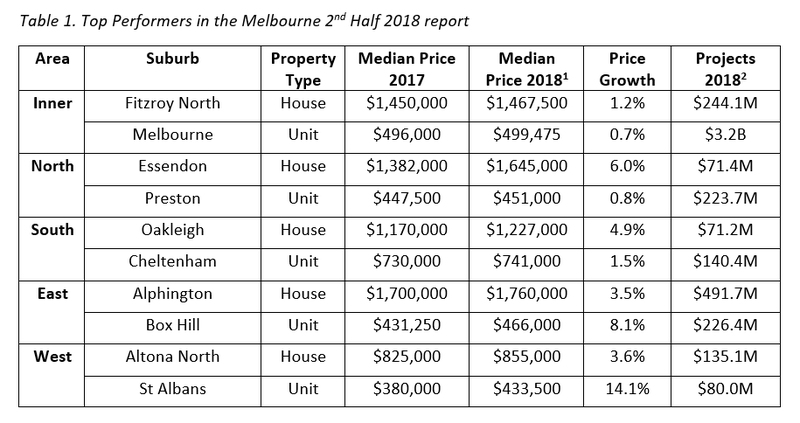 In the 12 months between the 2nd half of 2017 and the 2nd half of 2018 there have been some significant shifts in price brackets for houses in Melbourne. The proportion of sales in the lowest bracket of houses (below $500,000) have declined significantly to only 1.4%. Prices between $1,000,000 to $2,000,000, have become the dominant portion of the market, increasing by 23.3% to 50.5%. This growth reflects a decline in affordability measures and resilience in higher price brackets. However, the more recent cooling in property prices over the past 6 months indicates that the Melbourne property market is in the process of returning to a more sustainable level. In the 6 months between the 1st half of 2018 and the 2nd half of 2018, access to the $800,000 to $1,000,00 bracket has increased significantly to 18.9%. Meanwhile, access to the still dominant proportion of the house market (priced between $1,000,000 to $2,000,000) has declined to 50.5%. Further contractions were experienced in the upper price range of $2,000,000+, which reduced to 5.2%. This is good news for first home buyers and investors looking to enter the Melbourne house market. Affordable house suburbs, those with a maximum property sale price of the Victoria average state loan plus a 40% a premium, as per the Melbourne Affordable and Liveable Property Guide 2nd Half 2018, does exist. This includes: Coolaroo, Dallas, Meadow Heights, Bulleen, Notting Hill, and Fitzroy North. However, these suburbs fail to meet the liveability criteria set. To meet both affordable and liveable criteria, a premium of 95% (houses) and 25% (units) is needed to be added to the average state loan. Pascoe Vale and St Kilda East (two of the unit hotspots suburbs identified in the 1st half of 2018), have experienced high price growth in a short timeframe of 6 months and can no longer meet the affordability criteria. Considering all methodology criteria (property trends, investment potential, affordability, project development, and liveability factors), Table 3 and 4 identify key suburbs that property watchers should look out for. The Melbourne rental market has shown positive growth in house and unit median rental prices over the past 12 months leading up to December 2017. In the first half of 2018, 3 bedroom houses recorded annual rental price changes of 2.6%, while rental prices for 2 bedroom units have remained stable. This combined with overall declining and low vacancy rates of 2.2%, reflects very strong demand for rental properties in the Melbourne market. These conditions suggest that the Melbourne market is still absorbing the supply of residential accommodation. This is great news for existing owners, and signals that now is the time for new home buyers and investors to enter the market. The 1st half of 2018 is set to see $15.2B worth of infrastructure, mixed-use, residential and commercial projects. Queens Place is a mixed-use development project ($750.0M) and is set to deliver 1,700 units over two 80-level towers. The Paragon Apartments project ($200.0M) is the first of its kind and involves 48-storeys, housing 227 luxury units and a 3-storey high urban forest. In total 6,806 units, 24 townhouses and 47 houses will be added in the 1st half of 2018, and over 147 hectares residential land redeveloped. The Melbourne rental market has experienced downward pressure, especially for 2-bedroom units. Q2 2018 shows 2-bedroom units underperforming when compared to 3-bedroom houses, although both property types have decreased in median rent price over the past quarter. However, Melbourne’s vacancy rate has declined to 1.6% as of June 2018, giving investors security of cashflow with the increased uptake of rental accommodation. Caution should be taken as Melbourne is tipped to have the greatest unit supply over the next 2 years alongside Sydney. Current investors are urged to secure longer tenancies to minimise potential future investment risks. The 2nd half of 2018 is set to see $4.5B worth of projects, with mixed-use developments being a focus. Flinders Bank is the main mixed-use project ($800.0M) and is set to deliver 667 luxury units. Paragon Apartments ($200.0M) is the first of its kind and involves 48 storeys, housing 227 luxury units and a 3-storey high urban forest. In total, 6,651 units (including 1,816 units of student accommodation) and 63 townhouses will be added in the 2nd half 2018 to accommodate the growth of Melbourne’s population (2.7%). Affordability – suburbs with a median price below the maximum sale price of state average home loan plus allocated premium percentage. In this report 95% (houses) and 25% (units) was added to the average Victorian home loan, which was $426,027 as at June 2018. This is well below the 154% (houses) and 32% (units) premiums needed to purchase the Melbourne Metro median price, thus more affordable for buyers.